On April 11, the provincial government released its 2019 budget. Here are ONN’s perspective and views from the nonprofit sector. The Ontario government released the 2019 budget on April 11, its first since taking office last June. While many details in the budget were scarce, what we do know is that ministries the sector primarily works with have seen as much as a $185-million (23 percent) funding cut. However, we don’t know more specific details of how this will affect programs, services, and supports. And we don’t yet know the cumulative impact of these government cuts. This extends uncertainty and angst at a time when our sector was looking for clarity to respond to new realities, leveraging our foundation in communities with on-the-ground solutions. These cuts could also be retroactive, leaving organizations without information to make informed decisions about their current fiscal year. For ministries that appear to be receiving more funding (healthcare for example), it should be noted that this “increased funding” is lower than the rate of inflation, meaning an erosion of services in real dollar terms. Increased support of up to $1 billion for more child care spaces in centres which could be run “by for-profit or not-for-profit operators.” (more on this below). Aside from transfer payment agreement changes (outlined below), ONN was disappointed not to see a commitment to any of our pre-budget asks: reinstatement of Ontario Trillium Foundation funding; broader nonprofit access to the Infrastructure Ontario Loans Program; a website outlining legislation/regulations affecting nonprofits; and addressing processing fees and timelines for police record checks. Two bright spots for the people we serve: First, free dental care for low-income seniors to be delivered through Community Health Centres, Aboriginal Health Access Centres, and public health, and secondly, a $267 million investment in home and community care. Significant cuts to Economic Development (in the double digits), Environment, Municipal Affairs & Housing, Seniors and Accessibility, Indigenous Affairs, Attorney General, Children, Community & Social Services, and Tourism, Culture and Sport (see table below for ministry-level details). It is unclear whether the $59 million cut to the Ministry of Tourism, Culture and Sport reflects a reduction in Ontario Trillium Foundation (OTF) funding. OTF funding had been subject to a $15 million in-year cut in 2018-2019. The trend to individualized (direct) funding continues with child care and employment/training transformations – opening up nonprofit services to competition with the for-profit sector. The government announced a new Childcare Access and Relief from Expenses (CARE) tax credit for families, and investment in new spaces in schools. But it also relaxed regulations allowing for more for-profit and unregulated care. This mean the regulated nonprofit child care system could end up serving a smaller proportion of children. As previously announced, employment and training services are undergoing a system transformation, and will be opened up to for-profit competition. There are significant cuts expected in the Ministry of Children’s, Community and Social Services (a reduction in spending from $17B to $16B by 2021-2022). Some of this will come from reduced spending on social assistance (Ontario Works, Ontario Disability Support Program) and it remains to be seen what impact the rest will have on community programming. Legal aid will be cut by an amount that will increase to $164 million annually in 2021-2022 (p. 279). The Toronto Star reports that the cut for this year amounts to $133 million, or almost 30 percent of its budget, and that refugee and immigration programs will no longer be covered. This will have an impact on community legal clinics. Bear in mind that the Ministry of Children, Community and Social Services now includes funding and programming streams from the former Ministry of Children and Youth, Ministry of the Status of Women, and Ministry of Citizenship and Immigration (including newcomer services). The budget contains many re-announcements, including health care transformation, cost-shared mental health commitments, and the end of previous climate change measures. There are lots of strategies and program reviews on the horizon, but no dollars attached to the review or anticipated savings. It is safe to assume that many of these program reviews will result in further cuts and/or funding transformations. The budget contained no mention of social enterprise, gender equity initiatives, community benefit agreements, poverty, or newcomer services. ONN asked in our pre-budget submission to have processing fees and timelines addressed, especially for volunteers. The budget reiterated (p. xxi) the legal framework passed in 2015 that went into effect in November 2018. Fees and timelines have yet to be tackled. Change in regulations for target benefit pension plans specifically geared to allow non-union nonprofits to participate in these plans. ONN had asked for this change in 2017 and 2018 before our second pensions task force ultimately concluded that OPTrust Select was the recommended choice for our sector. However, we did liaise with Christian Schools International to learn about their TB plan and we are pleased on their behalf for this change in regulation (p. 236). Re-announcement of an employer self-regulating approach to employment standards enforcement announced last fall (p. 293). Re-announcement of the Low-Income Individuals and Families Tax (LIFT) Credit (p. 336) from last fall that was intended to be a mitigating strategy for eliminating the minimum wage increase to $15/hour. Re-announcement of an upcoming consultation to reduce compensation increases in collective agreements (that will include provincially-funded nonprofits) (p. 51). Amendments will be introduced to the Broader Public Sector Executive Compensation Act, 2014, which affects some provincially-funded nonprofits (p. 40). $1.3 million over two years for a partnership with the Rick Hansen Foundation on an accessibility certification program to identify barriers in buildings and businesses (p. 126) but no new AODA enforcement measures. Premiums are reduced as scheduled for 2019 and a new rate framework goes into effect in 2020 (p. 167). The budget includes a commitment for an enhanced LMI website with 500 job profiles and educational requirements, as well as better links to the federal Job Bank (p. 192). There is no information on what level of funding will be allocated to the Trillium Foundation. ONN’s request to have the $15 million reinstated following an in-year cut in 2018-2019 was not mentioned. ONN’s request on transfer payment modernization was reflected in the budget. The government signaled its intention to consolidate transfer payment agreements to multiples sectors (e.g. health, social services and education) to reduce administrative costs, providing service providers the ability to focus more on service delivery. No details on how the transfer payments would be delivered (e.g., umbrella agreements or forced mergers) were included (p. 42). The budget reiterated the findings of last fall’s Ernst & Young line-by-line review, confirming that the government is currently going through a multi-year planning process to find efficiencies, while protecting services and front-line staff. No further details were provided. 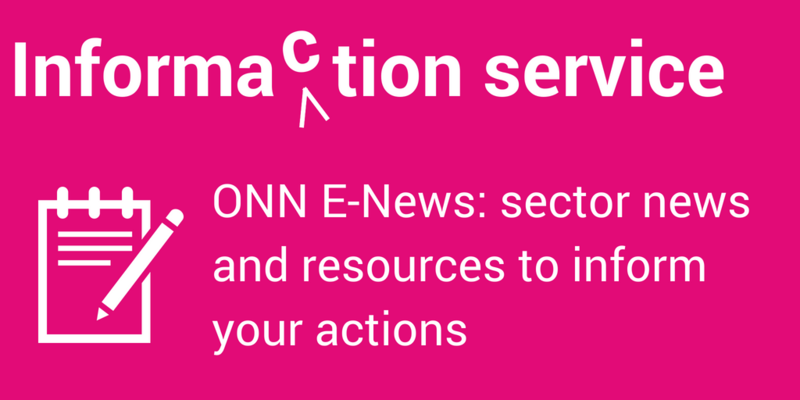 ONN continues to engage government in this process. (p. 20). The year-end money that organizations sometimes received from government for one-time expenditures (e.g., to fix a roof) will not be forthcoming any longer as the Province moves to reduce “unplanned” March spending (p. 39). The government announced “a dedicated program review process that will undertake program evaluations on a permanent and ongoing basis to ensure government services are meeting people’s needs and to identify ways to modernize programs and save money. . . . The ongoing process will be supported by a more robust financial management system” (p. 47). There was also a re-announcement of an enterprise risk system, which could have an impact on nonprofits’ level of compliance reporting under the Transfer Payment Operational Policy (some nonprofits’ access a lower level of reporting by being designated “low risk” by their partner ministries). The government will introduce the Fiscal Sustainability, Transparency and Accountability Act, 2019 (FSTAA) to enhance transparency and public reporting. This would require the Ontario Government to table a budget by March 31 except when there has been a recent provincial election (p. 35). The government is looking to accelerate the process to sell buildings and properties (p. 118). ONN encourages the government to ensure that all surplus properties are listed on the Nonprofit Lands Registry. The budget includes a table for capital investment plans over the next five years. 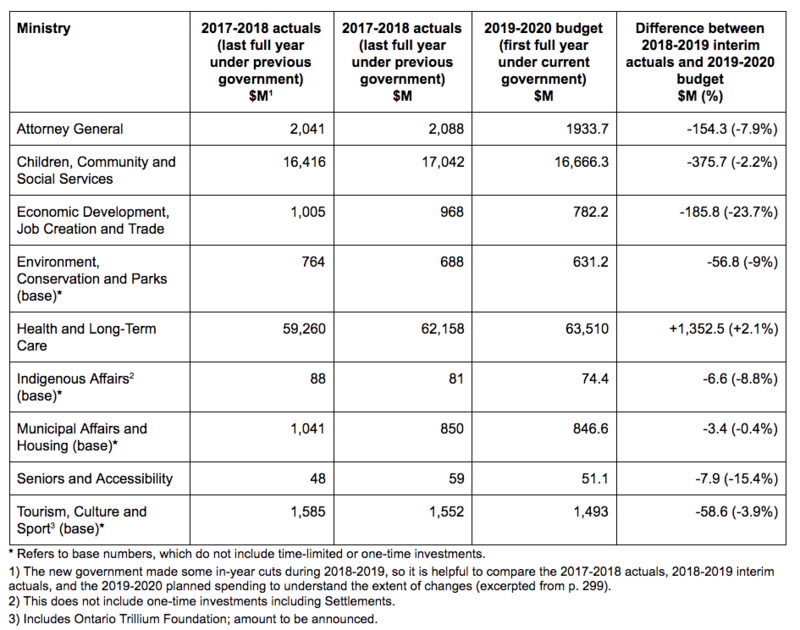 The government plans to spend $255 million on non-hospital health infrastructure in 2019-2020 and $299 million on social infrastructure (details not provided) (p. 14). ONN’s pre-budget ask to expand access to the Infrastructure Ontario Loans Program (IOLP) was not included. There were no references to social enterprise, social procurement, community benefit agreements, social finance, or social impact bonds. Re-announcement of the Ontario government’s data strategy which they intend to develop this year (p. 96). Reiterates commitment to “digital first” service delivery and consolidating back office functions and procurement across the Ontario Public Service and Broader Public Sector (p. 290). Cooperatives and credit unions will see their corporate legislation updated (p. 234-235) and the Ontario Co-operative Association was quoted in support of this move. There was no mention of ONN’s pre-budget ask for a single website that lists all the legislation and regulations that apply to Ontario nonprofits. The government will modernize and review granting programs, such as the Ontario Trillium Foundation, the Ontario Arts Council and the Ontario Music Fund to make sure that funding is targeted and administered efficiently, delivering the best outcomes for the people. The government will continue to make investments in the tourism, culture and sport sectors and its agencies, ensuring Ontario is open for business and open for visitors (p 295). The funding levels for these funding streams have not yet been released. The government has announced a new refundable Childcare Access and Relief from Expenses (CARE) personal income tax credit, starting in 2019, at an estimated cost of $390 million per year (p. 100, 329-331). See the childcare sector’s analysis of the new CARE tax credit. It is worth noting that only those families with incomes below $30K will benefit from the maximum 75 percent of eligible childcare costs credit. This credit is flexible with respect to the types of care eligible, including home-based, centre-based, and care in camp settings. There are also different opinions on whether the costing of this tax credit could be significantly higher than anticipated. The government will also spend up to $1 billion over five years to create new child care spaces in schools. Following de-regulation of the sector, these spaces could be provided by for-profit or non-profit providers. Emission standards are still in the works for industry. The Province aims to reduce emissions overall by 30 percent below 2005 levels by 2030 (p. 154). The Province continues to issue Green Bonds to help finance “public transit initiatives, extreme weather resistant infrastructure and energy efficiency and conservation projects” (p. 312). There are a number of provisions regarding waste reduction, conservation, species-at-risk and protecting the Great Lakes but no new budget commitments in these areas (157-158). Employment and training services will be under review. The budget announced that the cost-savings from the transformation of the health care system and creation of the super-agency Ontario Health will amount to annual savings of $350 million by 2021-2022 (p. 276). Seniors earning less than $19,300 a year — and elderly couples with a combined income of $32,300 — will be eligible for free dental care, to be delivered through Community Health Centres, Aboriginal Health Access Centres, and public health, beginning in summer 2019, at a cost of $90 million (p. 125). $267 million is dedicated to the expansion of home and community care. This will include investments on increasing front‐line care delivery, (personal support services, nursing, therapy and other professional services at home and in the community). Investments will also provide community supports such as meals and transportation, assisted living services in supportive housing, services for people with an acquired brain injury and services for Indigenous peoples and Francophones (p. 113). Back office efficiencies, “streamlined transfer payment agreements,” and “consolidating multiple service contracts” are expected to make it easier to manage system-wide performance and generate cost reductions of $100 million by 2021–22 (p. 276-277). The government re-announced $3.8 billion for mental health, additions and housing supports over 10 years, cost-shared equally with the federal government, starting with $174 million in 2019–20. Services will also target priority populations, such as Indigenous peoples and Francophones (p. 122). The government has confirmed its commitment to the National Housing Strategy through a bilateral agreement with the federal government, signed in April 2018, that provides for cost-sharing of $4 billion over nine years to address homelessness and housing affordability. The government will undertake a comprehensive review to identify opportunities to streamline and improve coordination of supportive housing programs (p. 148). There are no commitments to the Truth and Reconciliation Commission’s calls to action. There are brief mentions of services for Indigenous peoples in the sections on mental health, education, and northern development. Indigenous Affairs, as noted above, has been subject to a significant cut to its base funding. Victim compensation services will move from an adjudication model to an administrative model, resulting in $23 million savings annually starting in 2021-22, of which $6 million annually will be reinvested in victim services (p. 279). “Children’s and Social Services sector expense is projected to decrease from $17.0 billion in 2018–19 to $16.0 billion 2021–22 — representing an average annual decrease of 2.1 per cent over the period. The government is implementing social assistance reforms with the goal of achieving better outcomes for clients, reducing costs and administrative burden, and ensuring Social Assistance programs are more accountable to the people of Ontario. This includes transforming employment services through measures such as more effectively selecting system managers through a new competitive process. This will result in estimated annual savings of $720 million by 2021–22,” (p. 278). “Efficiencies” are to be found through sector transformation in developmental services, child welfare, special needs and early intervention programs, to “allow the government to continue investments in core services such as in the Ontario Autism Program,” (p. 278). There are no new commitments for shelters for women leaving violence or homeless shelters. “To make the most of sports in the province, the government is taking steps to unite the sector, assist with collaboration and focus resources to help build a stronger sports system,” (p. 219). “Working with sports organizations, the education sector, Indigenous communities and other organizations including municipalities, the government will develop a sports action plan,” (p. 220). Modernizing rules for professional and amateur combat sports (p. 220). “the government is removing some restrictions on independent child care operators as well as authorized recreational and skill‐building programs, such as after school programs for children in full‐day kindergarten,” (p. 106). Eliminating a fee applied to the sale of break-open tickets, as requested by the Ontario Charitable Gaming Association (p. 88). Exploring options to provide Estate Administration Tax relief, including additional tax relief in respect of charitable donations (p. 108). 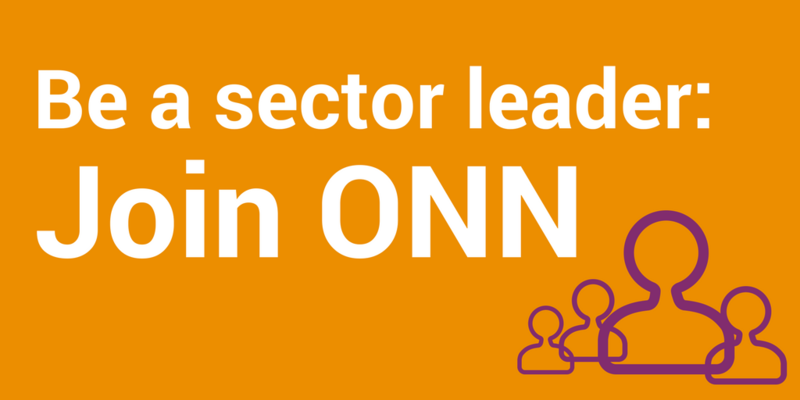 Like the Ontario Government, ONN wants a prosperous province where people can earn a living, raise their families, and count on the vital services and programs they need. This requires a healthy economy and a regulatory framework that enables the private and nonprofit sectors to focus on their business. Reduce the regulatory burden on nonprofits and charities by listing all legislation and regulations that apply to them on a single website. There’s already a great model in the Small Business Access portal and it’s a simple way to help all organizations, especially small enterprise, and ensure they are compliant. Expand the nonprofit sector’s access to the Infrastructure Ontario Loans Program, a repayable loan system that can help nonprofits unlock more jobs and self-sufficiency. Reduce red tape for volunteers by modernizing the police record check system across Ontario. The cost and processing time to get police record checks is a barrier to volunteering that could be addressed through a modernized, digitized system. Reinstate funding at the 2018 Budget level ($115 million) for the Ontario Trillium Foundation, which provides critical investments in community services and facilities across this province – such as food banks, sports facilities, arts organizations and social service providers. Reduce red tape in transfer payment agreements so organizations can focus on delivering the vital programs people rely on and government can manage fewer agreements. There are 5,000 nonprofits that currently have agreements with multiple provincial ministries, but each one is managed separately. The number of transfer payment agreements could be reduced by 14 per cent – without service or job reductions – simply through umbrella agreements. Streamlined, outcome-focused agreements can save taxpayers money in administrative costs and cut red tape for nonprofits. Nonprofits and charities are a critical part of the economy and society that government counts on every single day to provide services and supports to Ontario. We urge the Ontario Government to engage with nonprofits before making major changes to investment streams that affect them and the people they serve. The nonprofit sector can bring the voices of people who are affected by government decisions to help shape policy and budget decisions.